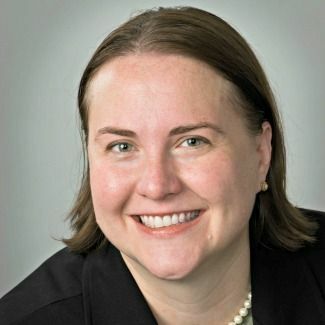 Corinne Funk Hammons ’93 first found her passion for public service as a student at Bryn Mawr. After graduation, she attended Harvard University, then went on to earn a master’s degree in public administration from the Wagner School of Public Service at New York University. In May 2015, she was appointed the CEO of Little Flower Children and Family Services, a non-profit that serves children, families and developmentally disabled adults across New York City and Long Island. Now, Hammons oversees more than 600 employees who provide services to nearly 2,000 people each year. When I was a sixth grader at Bryn Mawr, I was honored (and surprised!) to win the Julia McHenry Howard award for citizenship. Since then, the theme of citizenship has been a driving force and interest in my life. While at Bryn Mawr, I worked at the Kurt Schmoke Committee for Re-Election and had an internship at the Baltimore Development Corporation; later, I interned at the White House and served as a volunteer at the 1996 Democratic National Convention. I knew by the time I left Bryn Mawr that I would pursue a career at the intersection of community, policy, and economics, which led me to study economics in college, get a graduate degree in policy, and take on public service as a career. I have been working with non-profit organizations for nearly 20 years. First, I worked for Safe Horizon in NYC, serving victims of crime and abuse, both children and adults. I had a variety of roles there in program, finance, and development, and I was privileged to be part of the 9/11 response. Later, I worked on community development and housing services in the Long Island region as part of the Community Development Corporation of Long Island, ultimately overseeing the daily operations for the organization. I was also lucky enough to be part of the organization’s multi-year response to Superstorm Sandy. My current role at Little Flower combines my social service background and my commitment to working with vulnerable people. I believe strongly that an individual response to need with an eye to community impact is the most effective way to meet our mission. Throughout my career, having strong and accomplished women as mentors has been essential. Little Flower’s mission for the last 85 years has been to help the most vulnerable in society – children, adults and families. I think there can sometimes be a misconception that vulnerable people – people who need or ask for help – are somehow not our equals. This is absolutely not true. We are all equally worthy. At Little Flower, we focus on respect, dignity, and self-empowerment in all the work we do. For example, a new resident recently moved into our residence for developmentally disabled adults. He is not able to speak much and his mobility is very limited, but the day I met him he gave me a tour of all his favorite places in the residence. He was fully able to conduct this tour in his own way – and as a guest in his home, it was my responsibility to define what a "tour" is more broadly. Every memorable moment in my career has been a lesson that my worldview needs to evolve to meet our clients where they are, not the other way around. One of the biggest surprises of my work – though I shouldn’t be surprised about it at all anymore – is that leading non-profit organizations requires business acumen. Often, folks assume that charities are more like loose collectives – casual grassroots efforts for a cause. But while these organizations have a grassroots spirit, they are very complex institutions. As the CEO of Little Flower, I need to be both a steward of our mission and a businessperson to ensure we manage our resources carefully. I have taken on the responsibility for the people we serve and more than 600 employees, and I take that responsibility incredibly seriously. It is a constant presence on my mind and in my life. My time at Bryn Mawr prepared me for everything to come, from college to parenting to work. At Bryn Mawr, I learned to write well, think logically, have pride in place, take responsibility for community, and honor my commitments to myself and others. A Bryn Mawr education sets the standard for everything that follows: the tools and expectation to live a full, moral, meaningful life. Bryn Mawr also has provided a thread throughout my life – a lifetime connection to all the students and teachers and a special connection that my sister, Katie Funk Eisenberg ’04, and I share. I may be very far from Baltimore, but I’m a forever a member of the Bryn Mawr community.